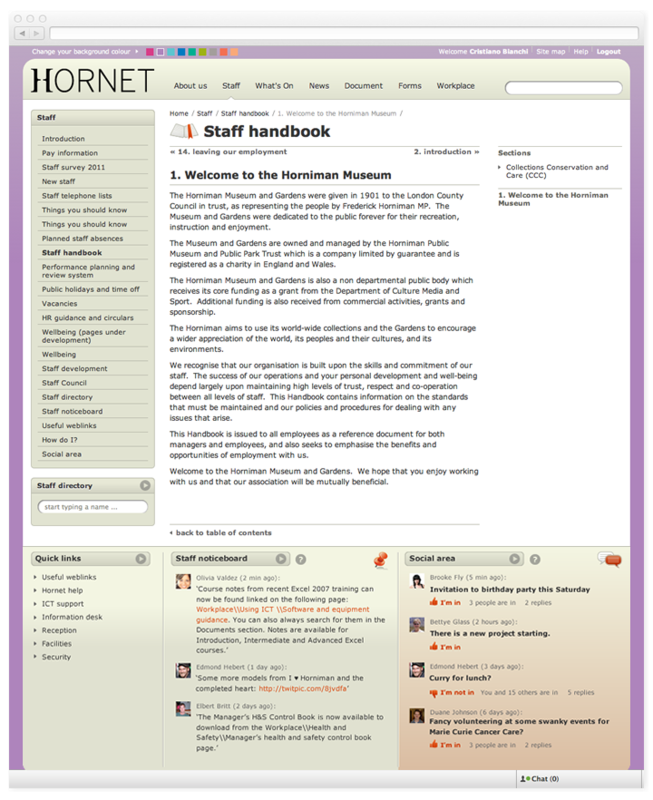 Keepthinking has completed the second stage of the Intranet for the Horniman Museum in London. The Intranet allows the over 140 staff to access internal information, news, events, documents, forms, manuals, etc. A site wide noticeboard allows everyone at the Museum to post their own announcements. The Intranet has been received enthusiastically from everyone! 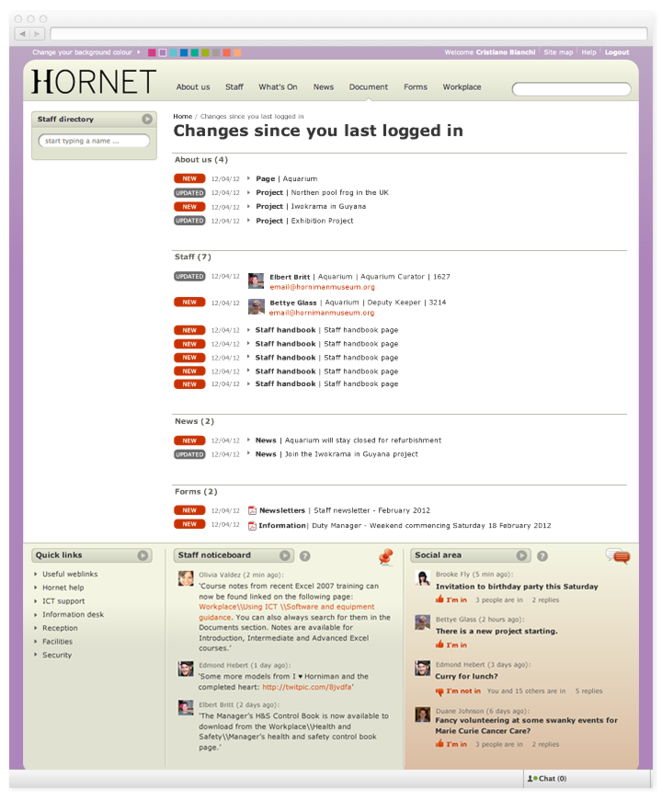 For obvious reasons we cannot provide a link to the Intranet: please get in touch for a demo. 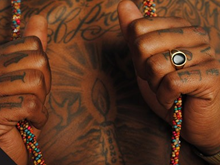 Everyone loves the new Museum's website, also because it's very colourful. 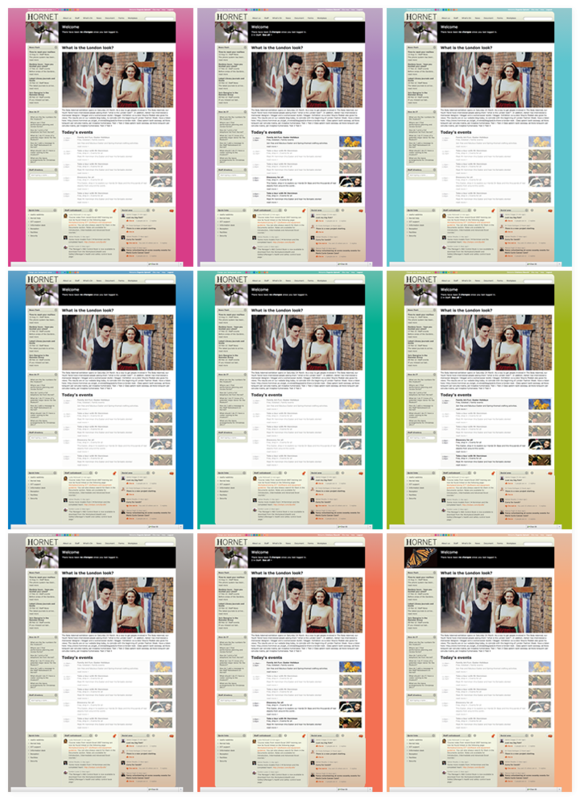 On the Intranet, everyone can choose their own background colour. 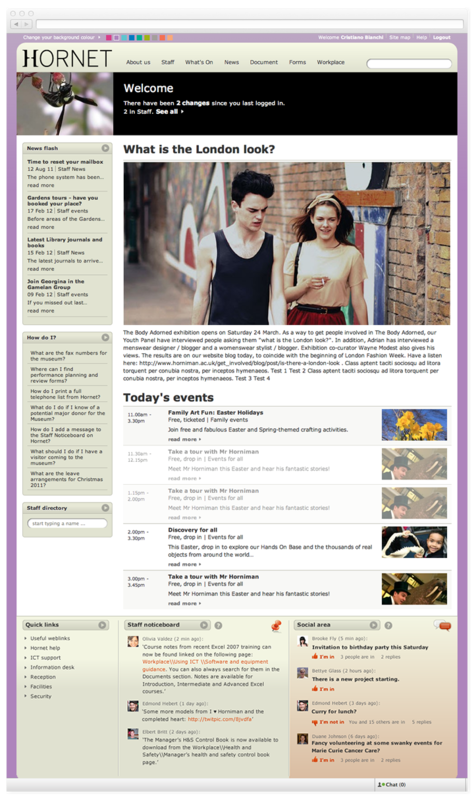 Upon login, the home page shows today's events (both public/museum as well as staff) with links to details. At the top, quick links to what is new/updated since the last visit. Whether staff have been away for one day or coming back from holidays, the Intranet will tell them what's changed since their last login, keeping the whole staff always up-to-date. The documents section lists general purpose documents and forms and allows searching and browsing by topic. The entire staff handbook has been published online, browsable and searchable. 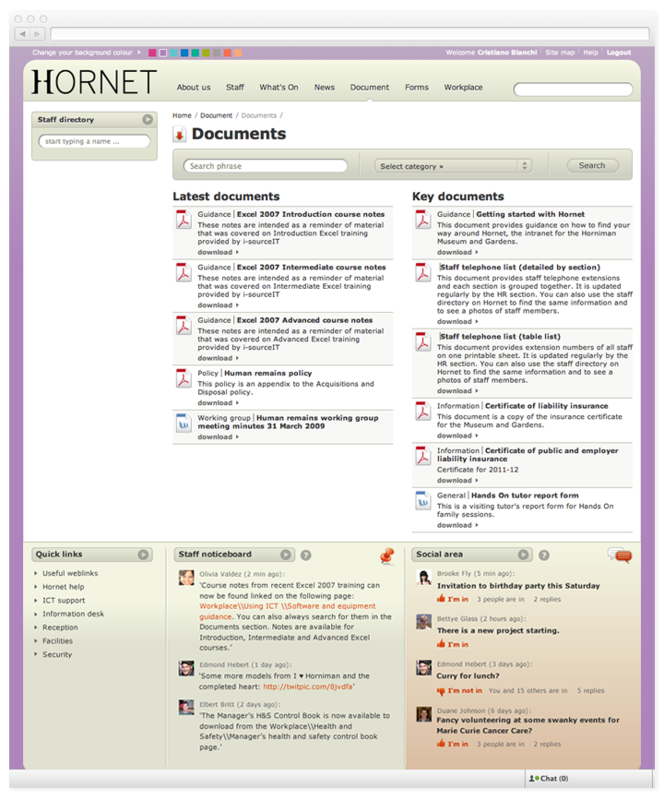 The handbook template allows to create articles nested in any order of complexity and has been re-used for other types of content. Everyone can post work-related short messages on the staff noticeboard, which is displayed on the footer of each page of the Intranet. A very popular feature. 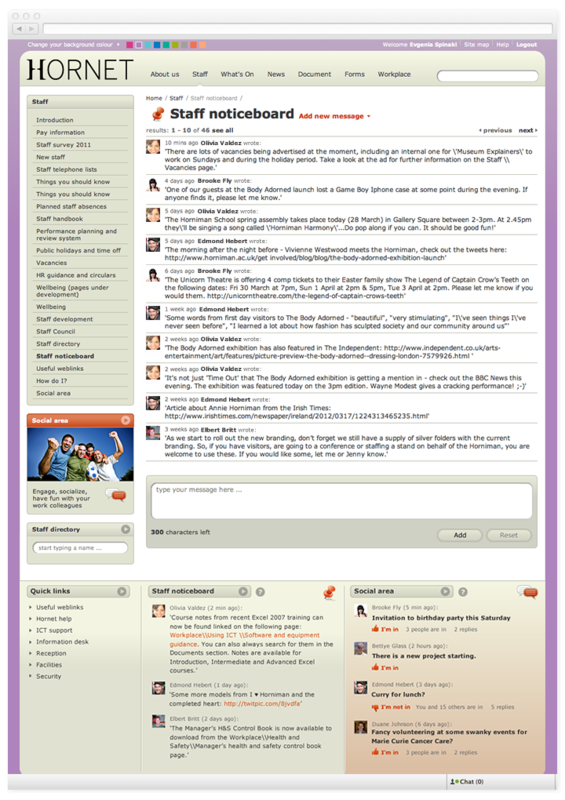 The social area allows people to chat with each other in real time as well as to post threaded messages and share images. This is the non-work related counterpart to the staff noticeboard.